57 days. Our exclusive variety will put a smile on your face as you harvest huge meaty pods, up to 9 in. long, all summer. 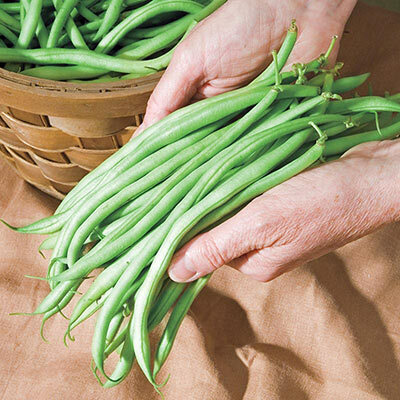 Stringless and straight at any size, these beans have a tender crisp texture and old-fashioned green bean flavor. They outyield every other variety in our trials and hold well on the plant, giving you plenty of time to harvest. Vigorous upright plants don't require staking and are resistant to BCMV and Anthracnose—ensuring more than enough beans for fresh eating, canning and freezing. 2-oz. packet contains about 150 seeds; sows a 25-ft. row. Note: Plants will ship in Spring. Height 18 - 24 inches. Germination 6 - 10 days. Botanical Name: Phaseolus vulgaris 'Pickin' & Grinnin ", Family: Fabaceae/Leguminosae (Bean Family). Spacing: 3 to 5 inches. Color: The color of the bean is white. Days To Maturity: 57 days. Form: Upright, no staking required. Size: Pod is 7.5 - 9 inches long. Fruit: Dark green pod color. I have planted these as my first choice for years with exceptional yield and 2nd crop in fall. Last year these were sold out. I planted two other varieties plus 2017 left over Pickin & Grinnin.The old seed outproduced the other varieties. I order the half pound and share with relatives who are impressed with how long and tender plus amount of yield these provide. They also are less inclined to get mold on the stems in late summer unlike other varieties I have planted. I plant these beans every year and they always are wonderful for both eating fresh and canning. Always a bountiful harvest. I tried these last year along with my old standby Top Crop beans as a baseline. These Pickin & Grinnin beans turned out AWFUL! They were undersized and "woody" when we picked them. I tried canning a few to see if they would be better than they looked, but they turned out so bad I threw them out. They might be good somewhere...but not here in NE Iowa.